File photo: Trinbago Knight Riders skipper Dwayne Bravo plays a shot in their first match against St Lucia Stars in the Hero Caribbean Premier League at the Queen's Park Oval, St Clair. DEFENDING champions Trinbago Knight Riders must be ready for battle, as they embark on a four-game away campaign in the Hero Caribbean Premier League (CPL). 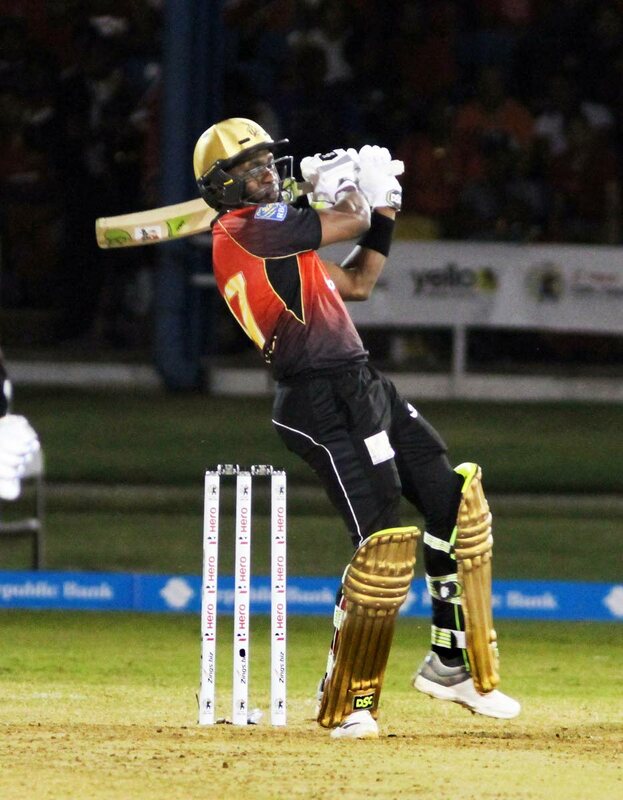 The Knight Riders began the defence of their CPL title with a 100-run hammering of St Lucia Stars on Wednesday, but then suffered a pair of defeats – by four wickets against Jamaica Tallawahs on Friday and by 42 runs against St Kitts/Nevis Patriots on Saturday. Now, they have left the comfort of their home at the Queen’s Park Oval in St Clair and will start their away trip with a contest against the Stars tomorrow at the Darren Sammy Cricket Stadium, Gros Islet, St Lucia. They follow that fixture with a visit to Florida to face Jamaica Tallawahs in Florida on Sunday, then face St Kitts and Nevis Patriots in St Kitts (August 26) and head to Bridgetown to meet Barbados Tridents (September 1). Borde noted that there are no major injury concerns within the squad. Kevon Cooper replaced fellow all-rounder Javon Searles for Saturday’s match. Sunil Narine, who impressed as an opening batsmen in the Indian Premier League, is yet to find form at the top of the order, but Borde is not ruling out the possibility of changes – both in terms of the starting XI and the combinations (batting and bowling). “The captain (Dwayne Bravo), coaches and management will decide the composition of the starting XI as we get closer to game-day,” Borde pointed out. Reply to "Borde: TKR must be ready for battle"